We are about to crown our first Champion of Customer Service for 2010. We have been receiving letters from a variety of industries where people are clearly going above and beyond when it comes to customer service. Looking at the quality of letters received, the panel is going to have a tough time deciding who the winner is for the first quarter. We will annouce the winner in our next newsletter and then highlight some of the top letters received in subsequent issues. Remember, if you witness or experience an act of Extreme Customer Service contact us below. Both the person and the company will be recognized for their great work! So many people focus on the bad things that are happening that each week I highlight some of the good people and good things that are happing around us. On a recent flight between Charlotte NC and Boston MA, I experienced another delay in Charlotte. This is not the first time that flight has been delayed. The last time my 8:30pm flight didn't depart until 1:30am. We were sitting at the gate and the pilot appeared while we were all waiting for an update. He gave his update and said that it would not be much longer. It is what he did next that made this so much fun. If you have traveled Jet Blue, you will know that they have this cabinet on wheels full of headsets and they cost $2.00 each. The pilot said "They can't do this at the gate, but I can because I am the pilot!" He then opened the cabinet and grabbed a large amount of headsets and asked "Who needs free headsets?" As he said this he was throwing headsets to everyone. The agent at the gate was having the big one and kept saying "There go my profits". As the pilot headed back to the plane he said "If anyone else needs headsets, just come and grab them, they are on me." As people streamed up to get their free headsets the gate agent was bedside himself. It was only $2.00, but he broke the ice, made us laugh and created a memory for us. How do you take a negative situation and turn it into a positive one? 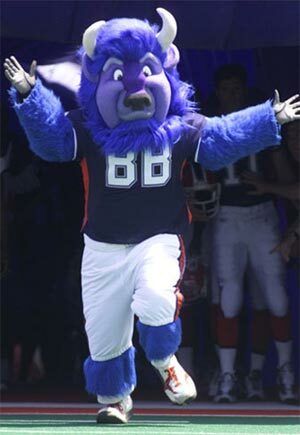 Identify the NFL mascot below. Brian correctly identified the logo as the Toyota logo. Enjoy your Dunkin Donuts gift card! I was just thinking about the balance in life between work and our personal lives. After all, I started this company because I wanted to change my balance and focus on my passions. How many times have you heard someone say that they would love to spend more time with the kids, but they needed to work long hours to provide for the kids? Before I share my thoughts, I want to share the thoughts of a couple of good friends of mine. I am going to change the names to protect the innocent, but I do not know if I would call them innocent! We were having one of those philosophical conversations one day and Bob said the time he spent with his children was very important to him and that he would refuse to work 80 hours per week to earn money for his children's college education,if it meant he wouldn't get to see his kids growing up. He said that he felt it was more important to spend time with his kids growing up, even if it meant they had to work their way through college just like he did. My other friend, Oscar, recently took on a new job at a new company. This was a great opportunity with increased responsibility and income. As with many new opportunities, he is now working very long hours and often leaves before his children wake up and arrive home after they have gone to bed. Not too long ago he was just sitting watching his young daughter and realized what he and they are now missing. It caused him to think about our past conversations about balance in life. He is a great guy and one of the hardest workers that I know. He was just thinking about what he had gained and what he had lost. So I guess you have been waiting to hear about me. Growing up we did not have much and my father never had a steady job after he broke his back when I was about eight years old. My mom was a nurses aid and that paid most of the bills. We never had extra money or material things, but the one thing I did have and I will cherish forever, was time with my dad. We were always together tinkering with old junk cars or bikes. 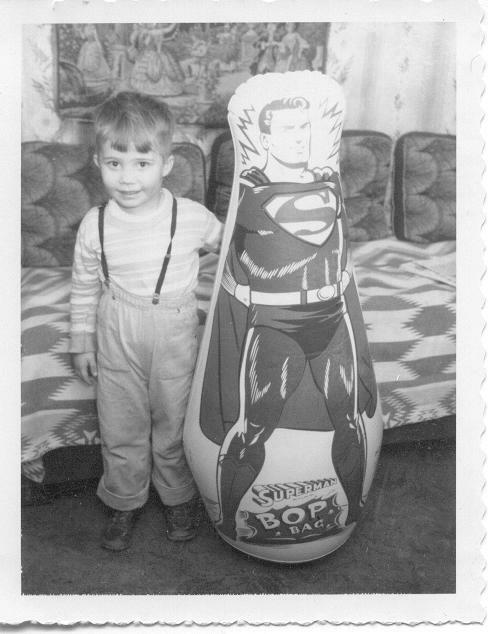 We both liked animals so I always had rabbits, dogs and the occasional raccoon or opossum! I would not have traded the time with my dad for anything. When I look at my friend Rick and his son Derek, it reminds me of me and my dad. They are best friends! So those are few of my thoughts on balance in life. I would love to hear your thoughts! How does someone benefit from doing business with your company? I went to a program recently and that question stuck in my head. Having thought about it for a while, I am now changing my website and how I think about IBP. It does not matter what industry you are in or what business you are in, this applies to any kind of business. When we meet with a potential customer and they ask us about our company, we jump into features faster than school kids into a creek on a hot summer day. Example 1: If you are a service company, you might say we have factory trained technicians, we have spare equipment, 24 hour service and the best equipment. But those are really features of your company. Because of the features, isn't the benefit to the customer "minimal downtime of the security systems" or "better protection of company assets" or "faster repairs" and "repairs completed on the first call will save them money"? Example #2: If you owned a security officer company you might say that you have less turnover, better benefits, better training or great uniforms. If you think about it, those are the features of your company. Because of those features, the benefits to the customer are consistent enforcement of policies, knowledge and recognizable staff and fewer tenant, employee and senior management complaints. In the case of IBP, I used to say that we provide consulting and coaching services with workshops in Creative Sales and Marketing, Extreme Customer Service and Team Building for Success. After I looked at the benefits it has changed to: We "drive your sales, drive your profits, drive teamwork and improve your business processes". Those are the benefits that our clients experience. So take a look at your website and marketing materials. Make sure it is not all features; explain the benefits of working with a great company like yours! NSA presents Speaker University - You can't afford not to go! This is two days of training for the unbelievable price of $297. Attention Entrepreneurs, Business Owners, Corporate and Service Professionals! Are you losing sales because of a boring presentation? Do you struggle with how to articulate your message so people get what you do? Professional speaking and presenting is a great way to attract more clients, generate unlimited leads, and grow your business effortlessly, especially when you master the skills of persuasion and influence. Imagine spending two days learning little known secrets to presenting your products or services in powerful and persuasive ways, and to motivate your prospects and clients to respond to your call to action. And it doesn't matter what your experience level is. You could be a seasoned pro looking for an extra edge... or an absolute beginner who's never given a presentation in your life! It's not as hard as you think. You just need someone to show you how to do it. It's simply a learned skill... just like riding a bike or driving a car. It may be a little challenging at first. But once you've got it, you'll be on autopilot-effortlessly giving passionate and persuasive presentations every time you speak! That's why the New England Chapter of the National Speakers Association has created Speaker University (SpeakerU). It's for people like you who want to supercharge their persuasive speaking skills... and make more money doing it. Divided up into three Schools, SpeakerU is a quick, easy way to gain confidence, credibility, and clients. · For the Corporate/Professional Service Speaker: School of Professional Presentation: Mastering the essential skills to set you apart from the competition. Selecting An Electronic Security Integrator - You Make The Call! For the past six weeks I have been running a series of articles helping people with the process of selecting an electronic security integrator. I know there are a few people who have been printing the newsletter for these articles each week, but I am not sure if there is enough interest to continue the series or not. I have plenty of material, because I take the tips from a four hour workshop I conduct called "How to Select and Negotiate with Electronic Security Integrators". So the call is yours! If enough people respond, I will continue the series for a few more weeks. If not, I will start a new topic. So let your voice be heard and email me below.